I was blessed last night to participate in the General Relief Society Meeting while sitting in the balcony of the historic Tabernacle on Temple Square. I was particularly moved to hear each member of the Relief Society General Presidency speak about the importance of keeping covenants. They emphasized that we are entitled to inspiration from the Holy Spirit to know how to keep covenants in our individual lives, that we should act on the promptings we receive. Listening to these sisters, I felt great peace and confirmation that supporting Ordain Women is the right way for me to keep my covenants with our Heavenly Parents. I have listened to and read the words of my sisters in the gospel about the pain that comes from exclusion from the priesthood: the lessons taught not with words but with actions that men are more important than women; that God interacts more with men, trusts them more, and develops their potential more; that without the priesthood, women are excluded from opportunities to bless others’ lives. As I listened to these words, I was thankful that I had chosen to be ordained to the priesthood as a young man. I reflected on the opportunities to bless and serve others that came into my life because of the priesthood. I was again moved to help my sisters in Christ obtain the same opportunities to bless and serve. 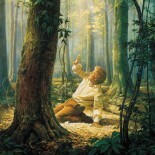 Sister Linda S. Reeves spoke of a priest in her ward whose mother had carefully prepared him to bless the sacrament by reviewing the significance of covenants. As I listened to the talks of the Relief Society General Presidency, I understood that by emphasizing covenants they are preparing sisters for the responsibility of the priesthood. Ordination for women will be disruptive—not to the church, but to our ingrained ideas of what priesthood is. As with the 1978 revelation allowing ordination for all worthy men, the Lord is tearing down our limited understanding of priesthood to make way for much greater blessings. Sister Reeves encouraged sisters to “claim your blessings” in the temple. I am greatly moved by the courage of my sisters in Ordain Women who are claiming their blessings in the priesthood. I know this will bring amazing blessings not only to them but to everyone they serve and to the whole church and the world. The Spirit has borne witness to my spirit that by supporting women’s ordination I am fulfilling my covenants to stand as a witness of Christ—who invites all people, female and male, to work in His vineyard—and to build up the kingdom of God on earth. What a wonderful experience! I love how simply, and eloquently, you explained the content and spiritual subtext. Beautiful thoughts! The burned tabernacle being turned in to a temple is perfect imagery for the process the church will go through in a metamorphosis to full equality for women. Aww shucks, Sherry. I’m just happy I get to be a part of this wonderful movement and witness the leadership and courage of women like yourself. This entry was posted on September 29, 2013 by EdwardJ.